Fans of How to Train Your Dragon will love this whimsical tale, the first in a series, by a Newbery Honor winner, featuring charming illustrations and pet "training tips" in each chapter. Crusty dragon Miss Drake has a new pet human, precocious Winnie. Oddly enough, Winnie seems to think Miss Drake is her pet—a ridiculous notion! Unknown to most of its inhabitants, the City by the Bay is home to many mysterious and fantastic creatures, hidden beneath the parks, among the clouds, and even in plain sight. And Winnie wants to draw every new creature she encounters: the good, the bad, and the ugly. But Winnie’s sketchbook is not what it seems. Somehow, her sketchlings have been set loose on the city streets! It will take Winnie and Miss Drake’s combined efforts to put an end to the mayhem . . . before it’s too late. This refreshing debut collaboration by Laurence Yep, a two-time Newbery Honor winner and a Laura Ingalls Wilder Award winner, and Joanne Ryder features illustrations by Mary GrandPré. Patience, Patience, and, above all, Patience! "A firm paw, after all, is the key to dealing with humans who are over ninety percent monkey - and there is no paw firmer than mine." Miss Drake, a feisty three thousand year old dragon, hasn't yet properly mourned the loss of her last human pet, when a new one burst through her door, completely unannounced. Winnie, an outspoken and sassy 10-year-old, claims that Miss Drake's favorite human pet, Fluffy, was also her Great-Aunt Amelia and that, in her will, she left her mansion to Winnie's mother and her "guest" to Winnie. And by "guest" she means Miss Drake, of course! As if Miss Drake was Fluffy's pet and not the other way around. How outrageously silly! As Miss Drake reluctantly takes little Winnie under her wings, the two unlikely friends take to exploring San Francisco, starting with its magical side. To keep her new pet occupied and happy, Miss Drake buys her a sketchpad. Unaware of its magical properties, Winnie begins to fill its pages with drawings of magical creatures. Imagine their surprise when Winnie's drawing come to life and escape into the city! The two of them will have to capture them and put everything back I'm order before it's too late. 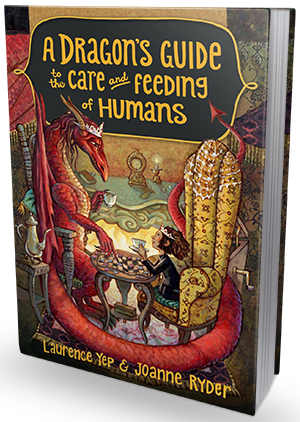 A Dragon's Guide to the Care and Feeding of Humans is quite a charming and delightful book. Fans of adventure stories filled with magical creatures (including but not limited to grouchy dragons) and witty humor will have a fantastic time reading it. This is a perfect little read for kids ages 8-12, though I'm confident adults will enjoy it, too. I certainly did! While in parts it can get a bit heavy on descriptions, it is overall a nicely paced, fast-moving and engaging story. And the descriptions are really quite breathtaking, adding to the magical atmosphere of this novel. The dialogues are sparkling and bursting with clever humor - I absolutely loved the good-natured bickering between the big old dragon and the little girl, their back-and-forth was very heart-warming and chuckle-worthy. Both Winnie and Miss Drake are wonderful characters. Their adventures are exciting and fun to read about! They make a fabulous team, even if they seem tiny bit ill-matched to begin with. Their friendship is truly extraordinary and they compliment each other well. Winnie is a bright and resourceful girl. Having grew up poor, she has a good understanding of the concept of money and knows not to be wasteful. She's the farthest thing from spoiled, though her family is now wealthy - all thanks to Miss Drake and her pearls. She's clever, witty and very mature for her young age, which makes her a relatable and fun character. I can imagine how much fun kids will have while reading this book. The idea of a pet dragon crying pearls and casting magical spells is exciting and very appealing, and I don't think there's a kid out there who wouldn't want that for himself. That alone makes this a great addition to every kid's bookshelf. A Dragon's Guide is a story that combines wisdom with entertainment, humor with moments of vulnerability that really touch your heart. It's definitely a book worth reading, even if children's stories are not your usual choice of reading material.